There is no question that over the last two decades dental implants have revolutionized tooth replacement and the practice of dentistry. The concept of dental implants is not new, the earliest recorded attempts of their use were discovered in the Mayan civilization dating back to 600 A.D. Today's highly successful dental implants consist of root replacement for a natural tooth, to which a crown is attached, just like the teeth in your mouth when you smile, there is no visible difference. In addition they do not decay and are relatively free from developing gum disease. As with most treatment modalities in dentistry today, this not only involves scientific discovery, research and understanding, but application in clinical practice. The practice of implant dentistry requires expertise in planning, surgical placement and crown fabrication; it is as much about art and experience as it is about science. It also requires teamwork between you, the patient, your dentist, an implant surgeon and dental technician. This is an overview article on implant dentistry, more on individual topics will follow in future issues to provide you with the knowledge you need to make informed choices together with your dental health professionals. The above illustration shows the assembly necessary to restore an implant with a crown. The assembly consists of an abutment with a screw that fits into the implant and a permanent crown which is then cemented onto the abutment. Teeth essentially can be thought of as having two main parts, the crown, the part above the gum tissues, and the root, the part that is suspended in the bone by the periodontal ligament (peri-around, odont-tooth) which keeps the tooth in place. A dental or endosseous implant (endo – inside, osseous – bone) is actually a root replacement, but unlike the root of a tooth it becomes anchored in the bone of the jaw, formerly occupied by a tooth or teeth. The amazing thing about currently used dental implants is that they actually fuse with, or “integrate” into the bone, a process known as “osseo-integration” (osseo-bone, integrate – to become part of). They are for the most part made of commercially pure titanium, a metallic substance used for many years in medicine and dentistry because it is not rejected by the body, being osteophilic (bone loving). The actual process of osseo-integration is essentially a biochemical fusion of living bone cells and bone substance to an oxide layer that forms on the surface of the titanium. As with many scientific advances the discovery of osseo-integration was happily, quite by chance! In 1952, Dr. P. I. Branemark, a Swedish orthopedic surgeon was studying healing in the bones of a rabbit limb. He inserted a small optical chamber through which healing changes in the minute blood vessels of the bone could be observed. When the study was completed it was noted that the optical chamber, made of titanium had fused to the bone and could not be removed. Nearly all currently used dental implant systems in their multiple shapes and sizes utilize this magical bone loving property of titanium. One of the many successful applications of osseo-integration has been in dentistry with the development of dental implants; root form replacements for missing teeth. Significantly, the application of implants in dentistry was researched for approximately 25 years before becoming available for clinical use in dental practice. Dental implants were first introduced for people who had lost all their teeth and who had great difficulty stabilizing or tolerating dentures, largely because they had lost so much jaw bone upon which dentures rest. Because dental implants fuse to the bone they stabilize it and prevent further bone loss. Resorption, is a normal and inevitable process in which bone is lost when it is no longer supporting or connected to teeth. Only dental implants can stop this process and preserve the bone. Since their introduction into dental practice in the late 1970s dental implants have undergone many improvements in design. 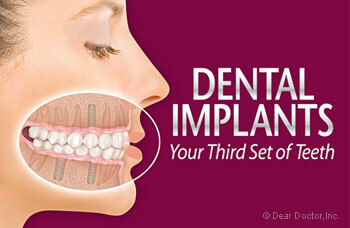 Today most implants are placed for either single or multiple tooth loss. The implants first used in the pioneering “Branemark” system were basically a one size fits all design. The original implants were all the same width, circumference, with only the length being variable. The original surfaces of the implants were machined smooth and polished. It was well known that integration is best in the densest bone, generally in the front part of the lower jaw.